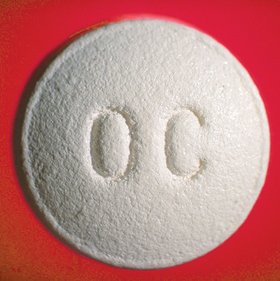 10 mg OxyContin (oxycodone HCI) controlled-release tablet. A morphine-like pain killer, widely abused as a recreational drug. The maker of the powerful painkiller OxyContin said it will stop marketing opioid drugs to doctors, bowing to a key demand of lawsuits that blame the company for helping trigger the current drug abuse epidemic. OxyContin has long been the world's top-selling opioid painkiller, bringing in billions in sales for privately-held Purdue, which also sells a newer and longer-lasting opioid drug called Hysingla. The company announced its surprise reversal on Saturday. Purdue's statement said it eliminated more than half its sales staff this week and will no longer send sales representatives to doctors' offices to discuss opioid drugs. Its remaining sales staff of about 200 will focus on other medications. Purdue eventually acknowledged that its promotions exaggerated the drug's safety and minimized the risks of addiction. After federal investigations, the company and three executives pleaded guilty in 2007 and agreed to pay more than $600 million for misleading the public about the risks of OxyContin. But the drug continued to rack up blockbuster sales. Dr. Andrew Kolodny, director of opioid policy research at Brandeis University and an advocate for stronger regulation of opioid drug companies, said Purdue's decision is helpful, but it won't make a major difference unless other opioid drug companies do the same. "It is difficult to promote more cautious prescribing to the medical community because opioid manufacturers promote opioid use," he said. Kolodny said that opioids are useful for cancer patients who are suffering from severe pain, and for people who only need a pain medication for a few days. But he said the companies have promoted them as a treatment for chronic pain, where they are more harmful and less helpful, because it's more profitable. "They are still doing this abroad," Kolodny added. "They are following the same playbook that they used in the United States." Purdue and other opioid drugmakers and pharmaceutical distributors continue defending themselves against hundreds of local and state lawsuits seeking to hold the industry accountable for the drug overdose epidemic. The lawsuits say drugmakers misled doctors and patients about the risks of opioids by enlisting "front groups" and "key opinion leaders" who oversold the drugs' benefits and encouraged overprescribing. State and local governments are seeking money and changes to how the industry operates, including an end to the use of outside groups to push their drugs.